Thanks for visiting me today, I've been a bit AWOL just lately, but hopefully things will now settle down a bit and I'll see you again soon! 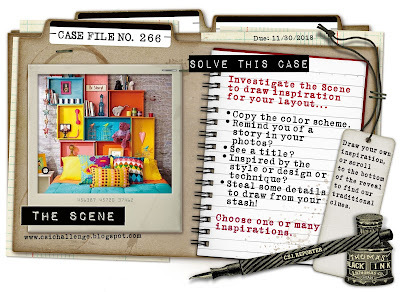 If you scroll to the bottom of the CSI reveal, you'll find all the clues you need to solve this Case - or you can just pull your own inspiration from this colourful Scene. I really enjoy following the Clues, so that's how I cracked this Case. I thought this would be the ideal opportunity to scrap a picture from around this time last year, showing my Uncle Ian and his wife Sally in their beautiful cosy cottage. I always love spending time with them and we can always be sure of a warm welcome. In the summer, we sit in the garden enjoying the sunshine and in the winter, we gather around the fire to catch up on all the family news. I tried out a technique demonstrated by Paige Evans on her YT channel, where you take small rectangles of patterned paper, fold them in half and attach to the background by the top, leaving the bottom free to add dimension. Once you're happy with the arrangement, you can tuck embellishments in and around to create an interesting layered backdrop for your photo. It worked really well as a way to echo the inspiration image. 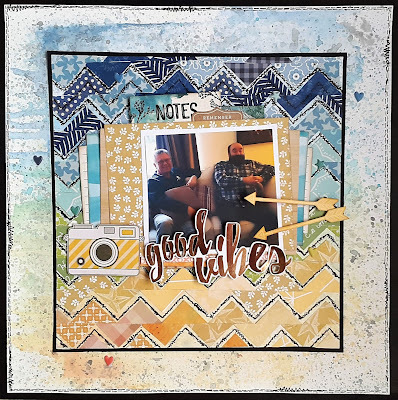 I've tried to create an illusion of "looking in " to the room, tucking home decor items and different textures between the layers and adding detail to some of the frames on the background paper with coloured pencils and word stickers. So which clues did I follow? Evidence: stars, hearts, frames, puffy stickers, telephone or other gadget, flowers, mimic boxed shelving as design element, fabric. Testimony: my journal is in the form of lots of word stickers in the frames, I have also since attached a tag behind the photo with that yellow peg. Thanks for stopping by today, see you again soon! CSI Case File #265 - Smile, You're a Star. 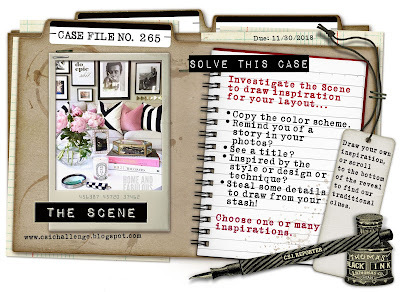 I haven't been able to blog so much recently, but today I have a new CSI Case File to show you. Nip over to the CSI blog to check out the full reveal and find all the clues you need to solve this case, or draw your own inspiration from the image to create a scrapbook page. You have until the end of the month to link up and be in with a chance to win one of the brilliant prizes on offer. It was really tricky to get a good photo as the light was really dull when I finished making this page, but hopefully you will get the gist!! This photo shows my great-niece Leila, who has such a sweet nature and always a smile on her face. Scheme: all the colours are there, plus I added some pops of the aqua from the inspiration image. Evidence: frames, flowers, animals, text print, transparent stickers, arrows, puffy stickers, triangles, shiny black acrylic heart, both gold and silver accents. Testimony: my journaling is handwritten inside the pink layered frames. 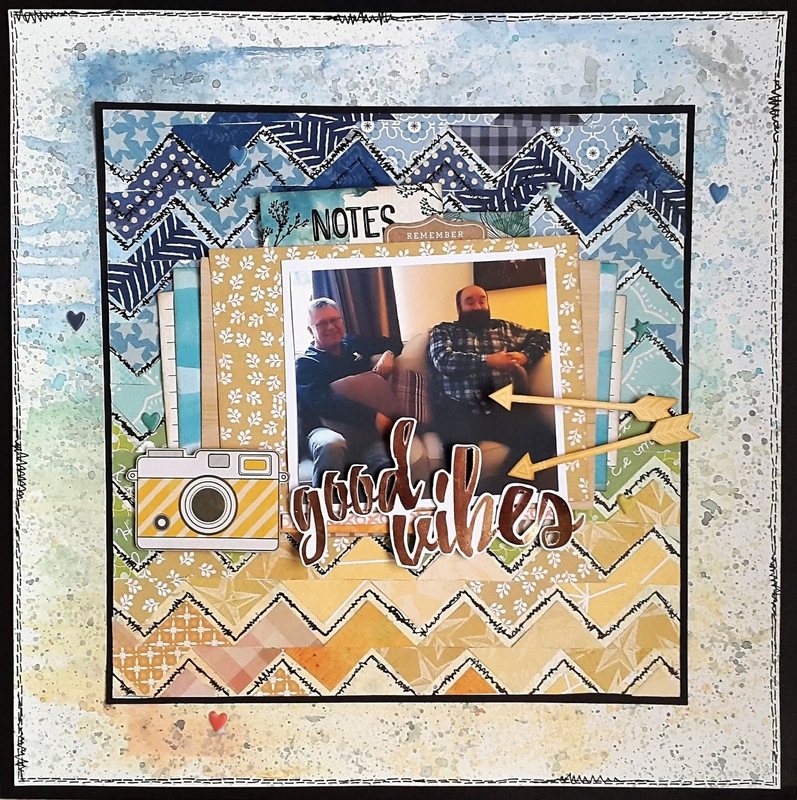 I was also inspired by the image to use different fonts and stacked-up words in my journaling and titles. How would you solve the case?